1 8:30 3 NOWC vs. Team Valley, Iowa Team Valley has several members of the squad that placed second to Archer last year, and their lighter weights are particularly good. 1 8:30 6 Crusader WC vs. Penn, IN "B" As is often the case with the Brother Martin's Crusaders, the "B" team of a state championship school, and particularly one from Indiana, should not be overlooked. 1 8:30 8 Penn Gold vs. Back in Black Back in Black is much improved from last year's team, albeit they are missing two Pickrens (William is recuperating and Cody graduated). They have several Florida stars, but they could have their hands full against the defending Indiana state champions. 2 10:00 3 Best Trained vs. Westbank WC First chance to see what the Allen, Texas, wrestlers look like, and who else may be with them. 2 10:00 8 Perry Meridian vs. Wrestling Academy of LA First chance to see the Perry Meridian team against a Northshore all-star team. 2 10:00 9 Without Limits vs. Penn "B" Allissa Maldonado of Without Limits may be the only girl competing. 3 11:45 4 Easton vs. Westbank WC First chance to see who Easton, Pennsylvania brought to the event. 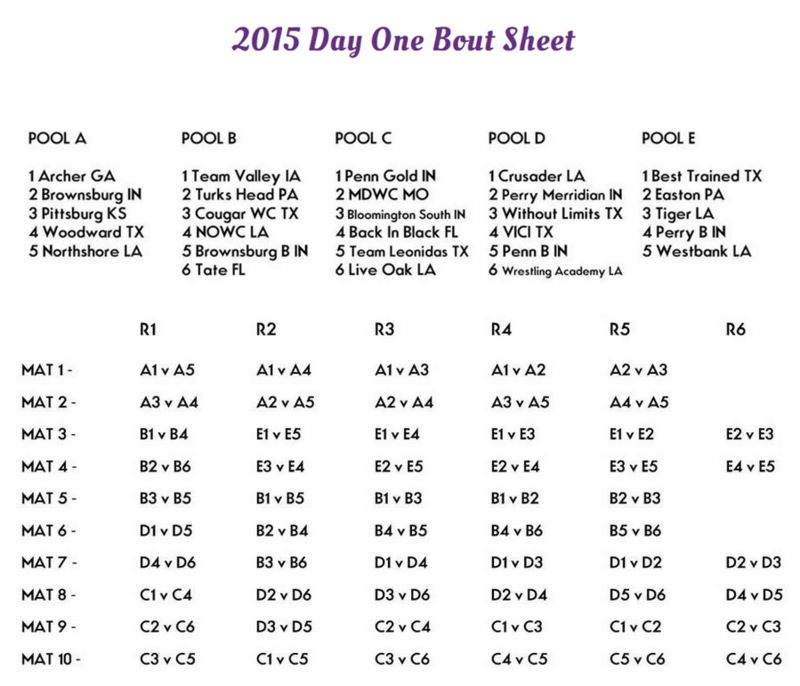 4 1:30 5 Team Valley vs. Turks Head Iowa vs. Missouri. 5 3:15 3 Best Trained vs. Easton Basically Allen vs. Easton - it should be a good match. 5 3:15 7 Crusader WC vs. Perry Meridian Perry Meridian placed 6th in the 2015 IHSAA State Finals and could present trouble for the Crusaders - or not. 6 5:15 7 Tiger WC vs. Easton The Tigers, like last year's Crusaders, get Easton in their pool. 8 Penn vs. Back in Black Perry Meridian vs. Wrestling Academy of LA Without Limits vs. Wrestling Academy of LA Perry Meridian vs. VICI Penn "B" vs. Wrestling Academy of LA VICI vs. Penn "B"
9 Major Decision vs. Live Oak Without Limits vs. Penn "B" Major Decision vs. Back in Black Penn vs. Bloomington S. Penn vs. Major Decision Major Decision vs. Bloomington S.